Staff file photo / A statue of Confederate general Alexander P. Stewart has been standing on the Hamilton County Courthouse lawn since the Daughters of the Confederacy placed the bust of him in 1919. POLL: Should Gen. Stewart's statue stay at the courthouse? The Chattanooga chapter of the NAACP has begun an effort to remove a Confederate statue from the front of the Hamilton County Courthouse. The move comes after a number of similar efforts in the country in the last few years. 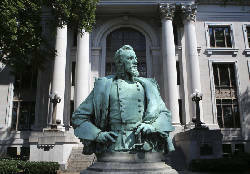 NAACP Chattanooga President Elenora Woods, said Wednesday the group plans to write letters to local leaders asking for the statue of Alexander P. Stewart, a Confederate lieutenant general, to be moved. "We are trying to get collective support," Woods said. "We are going to ask [officials] to join us, so this will be more of a community effort versus an antagonistic, us-against-them kind of thing." Attempts Wednesday to contact the Tennessee NAACP office for comment were not successful. The statue is a painful reminder of the history of blacks, Woods said, adding that monuments like Stewart's were erected during the Jim Crow era — it was unveiled in 1919 — when the Confederacy was glorified. Those memories, she said, are best left for history books and spaces dedicated to the preservation of history, not public government buildings. "We're not saying it's part of our history that needs to be erased," Woods said. "It should be put in a place that's more appropriate," such as the Chickamauga and Chattanooga National Military Park or a war museum people can choose to visit, she suggested. County commissioners Joe Graham and Greg Beck said Wednesday they couldn't comment on the request before receiving the NAACP letters. Attempts to reach other commissioners were unsuccessful. While Woods and many others believe the statue glorifies the Confederacy, Jim Ogden, staff historian for the Chickamauga and Chattanooga National Military Park, disagreed. The statue was erected to honor Stewart's role as a historian and as one of the original commissioners of the national military park — the first of its kind in the nation. "It was created by veterans on both sides — Union and Confederate — who fought in the battle here," Ogden said, adding the 1863 struggle for Chattanooga was one of the most important campaigns in deciding the outcome of the Civil War. The importance of that battle is why the national military park came to be, he said. Stewart moved to Chattanooga after becoming a park commissioner and was an active member of the community, which is why the bust is here, Ogden said. 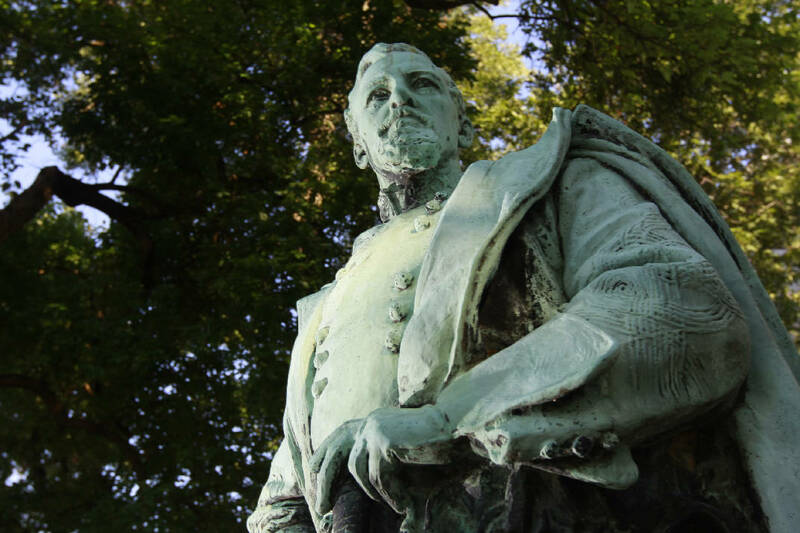 "[It does] acknowledge that he was a Confederate general, but if he had lived out his life in other places in Tennessee, I'm confident in saying there would not be a monument to him here in Chattanooga," Ogden said. Sam Elliott, Stewart's biographer and a local attorney, said moving the statue to the Chickamauga battlefield may not be an option because, to his understanding, statues of individuals are not supposed to be there. He also said Stewart was a Presbyterian elder, his nickname was "Old Straight" due to his conservative morals, and he was not a slave owner. "I guess because he was a Confederate general is why people think that," Elliott said. " While he didn't believe in slavery and didn't own slaves, when Tennessee left the union, a lot of people did not believe it was appropriate for the federal government to try to retake the South by force after Fort Sumter." Elliott said that is why Stewart joined the Confederacy. Another obstacle to the moving of the statue is the 2016 Tennessee Heritage Protection Act, which puts "the brakes on cities' and counties' ability to remove monuments or change names of streets and parks," the Times Free Press reported previously. New Orleans is one of the latest U.S. cities to remove its Confederate monuments. Mayor Mitch Landrieu called for the monuments to be removed in the emotional aftermath of the 2015 massacre of nine black parishioners at a South Carolina church, The Associated Press reported. The killer, Dylann Roof, an avowed racist who wielded Confederate flags in photos, rekindled the debate over whether such symbols represent racism or heritage. Contractors involved in removing the monuments were threatened, and workers wore bulletproof vests, helmets and face coverings to shield their identities as they removed the first three monuments. The removals took place well after midnight to minimize attention. As for Chattanooga, Woods said if the city wants to project itself as being progressive, one of the first things its residents need to do is acknowledge the past and move monuments such as Stewart's, which serve as a reminder of a dark time in history for many people. "Until we can do that, all these race relationship things are in vain," she said. "You have to attack some of the things that are keeping us from moving forward, and that's one of them."